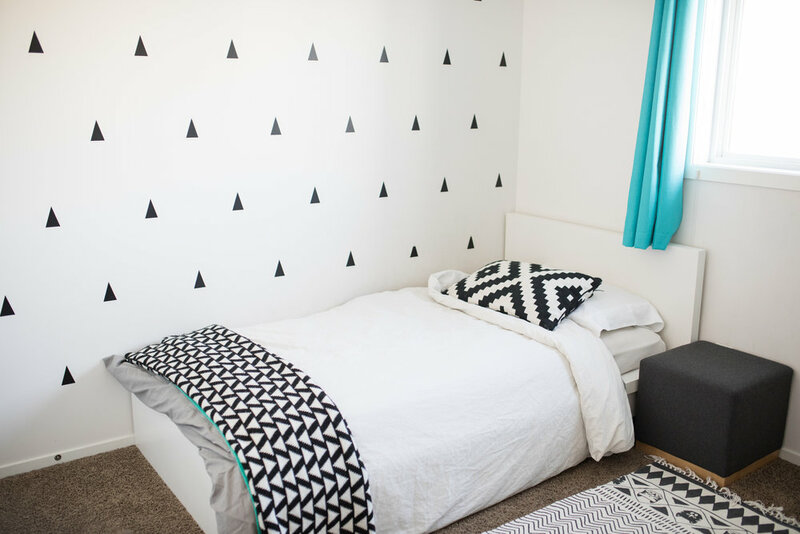 We had a lot of fun styling the boy's rooms and making them their own in different ways! The personalities of these two chunks are SO different and we really wanted their rooms to portray that! Both rooms are quite small so we had to make the most of their spaces. Almost all of their furniture is second hand or built by my hubs - can you tell we are a very DIY family? First things first - of course, we painted all the walls white! We got black triangle decals off of Etsy and hubs carefully measured out and stuck them on the wall! We got him a single bed from Ikea (second hand) that is super low to the ground in case he falls out for some reason! We added a rustic wood dresser to add a different texture (also second hand) and put a few monochromatic pictures above it! We purchased this little table from Ikea and stained it to match the rest of the stain in the house - watching him read and do puzzles on this mini table is one of my favourite things! We added teal curtains to give the room some colour... I know, I'm pretty crazy like that, as well as a lighter rug from H&M to brighten up the dark carpet. We had so much fun with Jackson's room making it Batman themed and also keeping it super functional! We painted the walls white, added some Batman mask decals from Etsy, and hung the "Welcome to the Batcave" sign from the company Olive and Papaya to complete the superhero look! We found this bunk bed at Ikea which had a desk with drawers underneath as well as a bookshelf on the side - perfect for books and Lego storage! This room is so functional and perfect for our little reader! Hubs took it to the next level and made a DIY wood house frame for our "reading room" which used to be an unused walk-in closet! We have a house of boys - who needs extra clothes hanging space?? Not us! The boys love to get their night time story read to them in there but it also functions as a great place to hide during hide-and-seek and a blanket thrown on top makes a sweet fort! If you'd like to see a DIY post on how he made it leave a comment below!